The Children's Services Research Policy Group (CSPRG) produces policy research through participatory approaches that feature collaborative partnerships with children's service and advocacy organizations. CSPRG's approach to participatory research emphasizes the expertise of service providers, policy specialists and advocates who drive the development of research directions, questions, and design, as well as data collection and analysis. 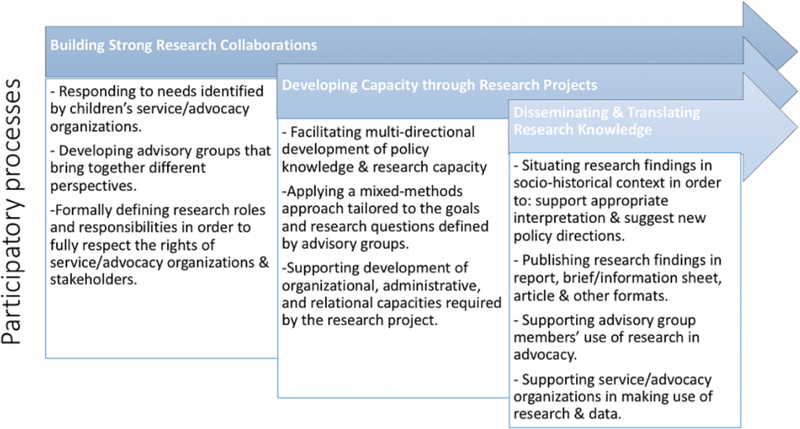 A key goal for CSPRG is to support the development of research capacity through actions such as: the facilitation of advisory/working groups allowing for multi-directional capacity building, the translation of research findings to multiple audiences, the support of evidence-based advocacy efforts, and provision of the long term technical support for service/advocacy organizations making use of research and data. In our past and present work with First Nations communities, participatory research approaches have involved the operationalization of OCAP® (Ownership, Control, Access, and Possession) principles, which function to ensure that First Nations children, families, and service providers are the direct beneficiaries of any data, findings, and outcomes of any First Nations research partnerships.